Stretch out in the spacious living room as you savor the glow of the gas fireplace. Soak in the hot tub on the expansive meadow and count the stars. Laughter is sure to echo thru the cabin as you shoot a game of pool. Twin Oaks has it all. 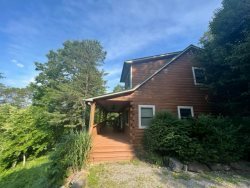 Secluded mountain top cabin with a huge yard to play in, games included. This cabin also has a pool table for family games nights. Relax in the Hot Tub and spend evening by the fire pit. 2 Bedrooms & 2 Baths: The main floor private bedroom has a queen bed and an en suite bathroom with a tub and shower combination. The upstairs private bedroom has a queen bed. The second bathroom is across the hall and has a jetted bath tub and a shower combination. For reviews please click on the review tab. Maximum capacity of up to 6 is based on county guidelines. We loved the cabin and all the woodwork. Everything was perfect we had an amazing time. we will be back. This Cabin was so great, we did not want to leave! We played all the outdoor games as well as all the games inside. We made smores and grilled out and the hot tub was amazing! Definitely will be coming back!!! We loved our week here in the cabin! We came up to visit family., took a day to visit Gatlinburg, and just enjoyed ourselves being in between. So clad we chose this cabin. It looked beautiful in our day of snow. When we arrived, I was so astonished on how beautiful it was. I had fun playing board games, watching movies and taking pictures. Great Time We played every game, cards, board games, pool, outside games and even some video game. Can't wait to come back. I loved having the email with the turn by turn directions since we didn't get to the cabin til dark. Love the cabin! We rode our motorcycle up for an extra long weekend and had a great time. We rode Tail of the Dragon and the Skyway. We rode to Gatlinburg in the pouring rain!! We rent a cabin every year and spend a long weekend. We will back next year. We loved our stay at Twin Oaks! Conquered all that the North Carolina mountains had to offer! Fantastic weather. Everything definitely exceeded our expectations. We will definitely be back. We had a fantastic time! WE love white water rafting with Rolling Thunder!